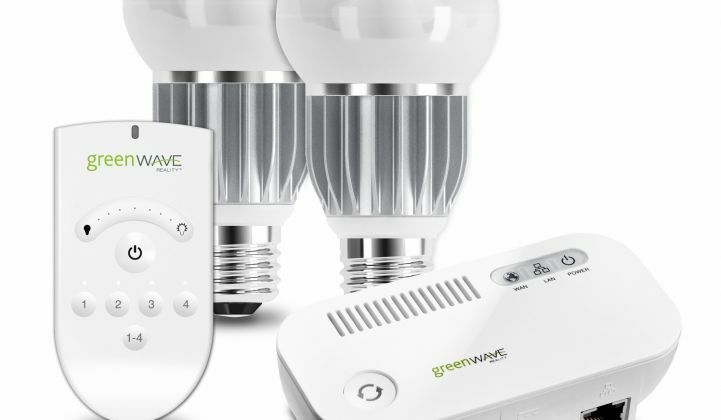 GreenWave Reality and NXP launch 6LowPAN mesh-networked LED bulbs and home energy control platform. What can you do with an LED light bulb that has its own internet address? And how much would you pay for it? Those are some of the questions that GreenWave Reality and NXP Semiconductor are asking the $100 billion lighting market. On Monday, the two launched a new line of Wi-Fi-networked LED light bulbs, along with the Connected Lighting Solutions platform to run them. GreenWave, a startup founded by ex-Cisco execs, has already started shipping the bulbs to European utility customers, including Seas-NVE in Denmark, Nuon in the Netherlands, and Fortum in Sweden. The new bulbs are also certified for sale in the United States, where a basic kit, containing a gateway device and four bulbs, along with a handheld remote, will cost about $200, GreenWave CEO Greg Memo said in a phone interview. Individual bulbs run in the $20 to $30 range, Memo said -- a reasonable price, compared to the Energy Star-rated, fully dimmable LEDs that might be seen as competition on the market. In Europe, on the other hand, utilities have already been supplying NXP networking-embedded LEDs to key customers as part of their energy efficiency initiatives, he said. Monday’s announcement means they can now add GreenWave’s energy management platform to support them as well. Before you dismiss this idea of a $30 networked light bulb as an expensive experiment, bear in mind two factors. First, the rise of the “Internet of Things” is pushing basic IP connectivity down to pacemakers, security webcams, smart thermostats and other devices at a pace that should cut costs dramatically in the years to come. Second, there’s a new breed of IPv6-enabled mesh networking technology that’s allowing these devices to receive and pass along data to one another, which beefs up the topological factors (i.e., walls) that can cause trouble for low-power wireless networks. Standards involved in this new IPv6 mesh networking include 6LoWPAN, which is part of Cisco’s new smart grid wireless networking technology being adopted by partners like Itron, Elster and Alstom. Most of North America’s smart meters deployed to-date run on mesh networks that have essentially proprietary technologies for the physical communications layer -- that is, radios -- that carry their data. Another standard under development, IEEE 802.15.4g, is meant to standardize those technologies, with big participants including Silver Spring Networks, Elster, Itron and Toshiba’s Landis+Gyr. Inside homes and buildings, on the other hand, low-power mesh technologies ZigBee and Z-Wave are now vying for dominance, though it’s hard to call the competition definitive at this point -- after all, the market is still in its infancy. But Wi-Fi is certainly part of that competition as well, with plenty of smart thermostat and home energy control devices offering Wi-Fi along with ZigBee, Z-Wave or other communications options. The Smart Energy 2.0 standard being developed in conjunction with the U.S. National Institute of Standards and Technology (NIST) will support Wi-Fi, ZigBee and powerline carrier HomePlug when it’s released next year -- if it comes in on schedule. Of course, lights are great places to add wireless mesh nodes, since they’re likely to reach every part of the home or business they’re deployed in, Memo noted. There are a host of smart lighting networking startups like Adura, Daintree Networks, Redwood Systems, Digital Lumens and Enlighted, to name a few, that are seeking to take advantage of that fact as well. Behind all the technology options, however, there’s the critical component of the user experience, he added. The holy grail of smart lighting is to build a light bulb that screws in, turns itself on, finds its local network and signs itself up for duty with GreenWave’s cloud-based software management platform. But as any “smart home” technician will tell you, today’s in-home networking technologies are far from that simple to install and initialize. Reports of so-called “interoperable” devices that can’t find each other on the network, or can’t communicate once they're hooked up, are legion. GreenWave and NXP aren’t the first to come up with the idea of a house full of IP-addressable smart light bulbs. Google and Lighting Sciences Group announced plans for a Wi-Fi-connected LED bulb to run over Google’s Android@Home platform, though we’ve seen little from the partners since then. NXP is believed to be the preferred supplier for that partnership as well. But Memo said that he’s not aware of any other commercial offerings of the scale and scope of GreenWave and NXP’s new lighting solution. Controls options range from presets and schedules, to motion sensor and security card-triggered lighting, to daylight dimming, or dimming lights to respond to peak price emergencies, Memo said. In fact, GreenWave has been testing its technology with such partners as Dong Energy and IBM in smart-grid-to-smart-home projects like Denmark’s Bornholm Island project, which links wind turbines, plug-in vehicles and smart home heating controls to balance power supply and demand. Last month, Sweden’s Fortum announced it was rolling out GreenWave’s home monitoring and energy management platform to its customers. Sweden’s deregulated market allows utilities to vie for customers, and adding nifty in-home energy controls could be a way to win over more of them, as well as to save energy. The next test, of course, will come in the marketplace, as customers do or don’t buy in to the IP-addressable light bulb vision -- and as they start to prove out the savings that smart LEDs promise. In the meantime, NXP and GreenWave support ZigBee and Z-Wave as well as Wi-Fi, and are looking at high-efficiency fluorescent lights as well as LEDs as targets for control, Memo said. Let the smart lighting network propagate across a thousand ceilings.